The Broadway Rose New Stage is about 15 minutes south of downtown Portland. Take I-5 south to exit 294, OR-99W toward Tigard/Newberg. 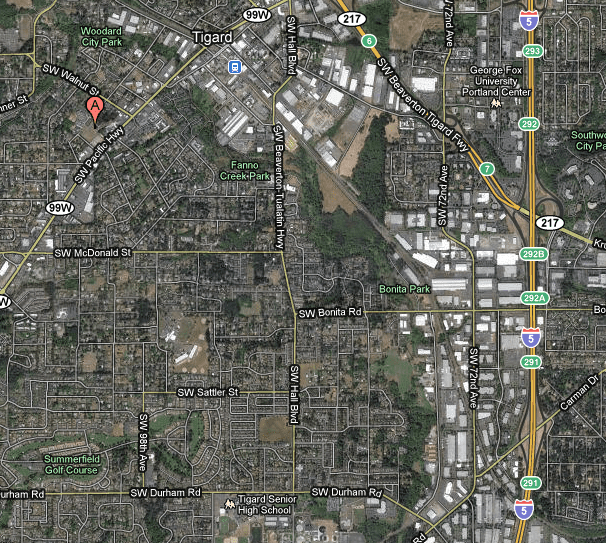 Stay on 99W/SW Pacific Hwy for two miles. Turn right onto SW Walnut St. Make the next left onto SW Grant Ave. Go to end of block. The New Stage is on your left. If traveling from the south, take I-5 north and take exit 292A to merge onto OR-217 N. Stay in the right lane and take exit 6 (first exit) for OR-99W/SW Pacific Hwy. Turn left at top of ramp onto Hwy 99W and proceed for about 1 mile. Turn right onto SW Walnut St. Make the next left onto SW Grant Ave. Go to end of block. The New Stage is on your left. Free parking is available in the theater parking lot, with additional parking at the C.F. Tigard Elementary School.